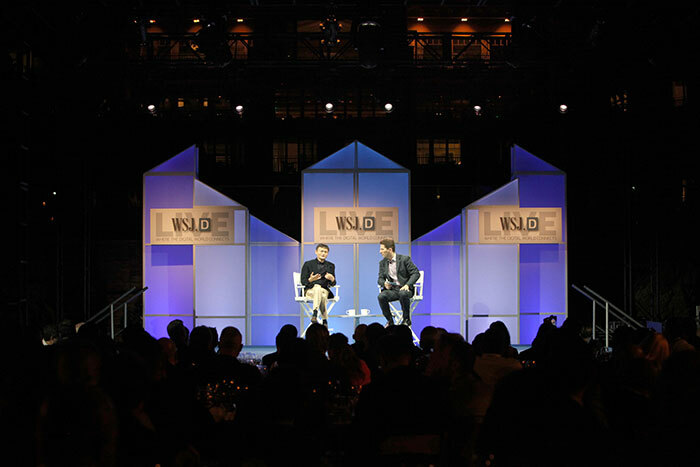 New York (January 21, 2015) – When WSJDLive, “where the digital world connects,” kicked off its inaugural conference, WorldStage was there to provide video systems and displays to Bay Area event and entertainment company e2k Events x Entertainment. 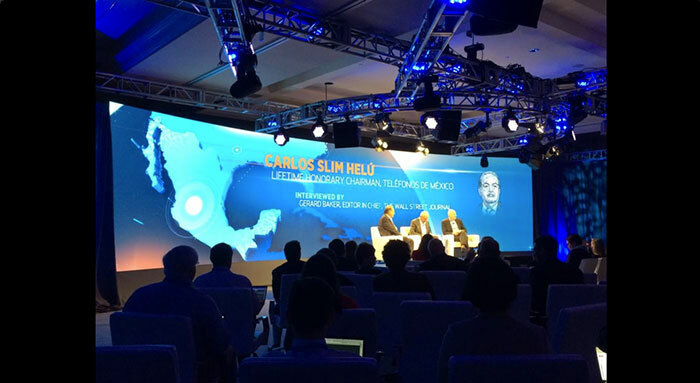 An international technical conference, WSJDLive brought together global CEOs, leading thinkers and top entrepreneurs in a series of interviews, round table discussions and interactive events at The Montage, Laguna Beach, California. Speakers included writer/director/producer James Cameron, Apple CEO Tim Cook, billionaires Jack Ma and Carlos Slim, DreamWorks Studios co-founder Jeffrey Katzenberg and UCLA chancellor Gene Block. The expansive event had components throughout The Montage resort, which is luxuriously sited alongside the Pacific Ocean. WorldStage provided video systems and displays for the main keynote room, the lobby area and the outdoor stage. The evening sessions at the outdoor stage featured projection mapping by WorldStage onto the rear façade of The Montage. The projection content, created by graphical design firm 3Monkeys, served to open and close presentations by Tim Cook and Jack Ma. The location’s architecture, with numerous overhangs, balconies and corners, presented a challenge for the mapping process. “We could only place the projectors in specific locations, so there was a lot of off-axis shooting to compensate for,” says May. WorldStage also provided a three-camera switch and record package to capture the speakers’ appearances for posterity – and for news outlets. “Our footage was all over the network news the next morning,” May reports. In the lobby area WorldStage created an interactive video wall, which attracted a lot of buzz. The 3×3 configuration of NEC LCD monitors displayed tweets extracted live from internet sources and displayed to attendees. “For display processing on the video wall, we used a Vista Systems X20 to provide a canvas of multi-window presets that could be reconfigured at the touch of a button.” May explains. In addition to the video set ups for the outer areas, WorldStage provided an extensive system for the ballroom keynote presentations consisting of a curved 45-foot wide LED wall with 3.9-mil pixel pitch as the main feature. “This main LED wall with 3Monkeys content displayed was a stunning backdrop for the presenters,” says May. At WorldStage, James Sarro and Dave Morris were the project managers, Shane Zinke and Frank Musgrove video engineers, Terry Nakamura projectionist, James Armstrong the Spyder operator, and Ken Stanford and James Boress video directors.